As the Tesla Semi’s expected production date draws nearer, the company appears to be ramping the road tests of its two electric truck prototypes. Apart from sightings of the silver Semi test mule across the United States, the red wrapped prototype that re-emerged last month seems to be racking up some real-world miles as well. Just recently, the red wrapped electric truck was spotted conducting a run close near Tesla’s Fremont factory in CA. Unlike the red truck’s previous sightings, where it was spotted pulling a trailer, the Semi was running on its own this time around (known as “bobtailing” in the trucking industry). As could be seen in a video of the vehicle, the Semi is especially nimble on the road without a trailer attached. Considering its red color scheme, the Tesla Semi prototype is undoubtedly eye-catching. When it was initially spotted, some members of the Tesla community even thought that the red vehicle was an entirely new prototype. That said, it eventually became evident that the truck was just a wrapped version of the matte black test mule that debuted back in 2017. When the newly-wrapped truck was first spotted last month, Tesla enthusiast and r/TeslaMotors member u/CardSpecialist encountered the vehicle at the Kettleman Supercharger, where he was able to speak with the red Semi’s driver briefly. As noted by the Tesla community member, the Semi’s driver lightly pointed out that the red wrap had been attracting a lot more attention to the vehicle compared to its previous matte black paint scheme. Tesla did not really provide any details as to why it opted to wrap the matte black Semi prototype in such an eye-catching color. With such a noticeable hue, though, it is difficult to argue that the all-electric long-hauler stands out even more, making it more noticeable for potential reservation holders. The Tesla Semi, just like the company’s other vehicles like the Model 3, has the potential to disrupt a lucrative, high-profile industry. The trucking market, after all, presents a lot of opportunities, with the sector handling the transportation of up to 71% of the US’ food, retail goods, and other cargo being delivered every day. In the American Trucking Associations’ American Trucking Trends 2018 report, it was stated that the US trucking industry generated over $700 billion in economic activity in 2017. That’s a big market, and one that is just waiting to be disrupted and tapped. In true Tesla fashion, the Semi is equipped with semi-autonomous features. During the vehicle’s unveiling, Musk hinted at an upcoming “Convoy Mode,” which would allow several trucks to draft close to each other semi-autonomously. Concept videos of Convoy Mode in action also hint at one manned Semi leading a couple of unmanned electric trucks. In his presentation for the Semi, Musk mentioned that the feature was already something that Tesla can accomplish with its existing technology. The Tesla Semi is expected to start production sometime in 2019. That said, following statements from Tesla head of investor relations Martin Viecha hinted that the electric car maker would “earnestly” start manufacturing the truck by 2020. 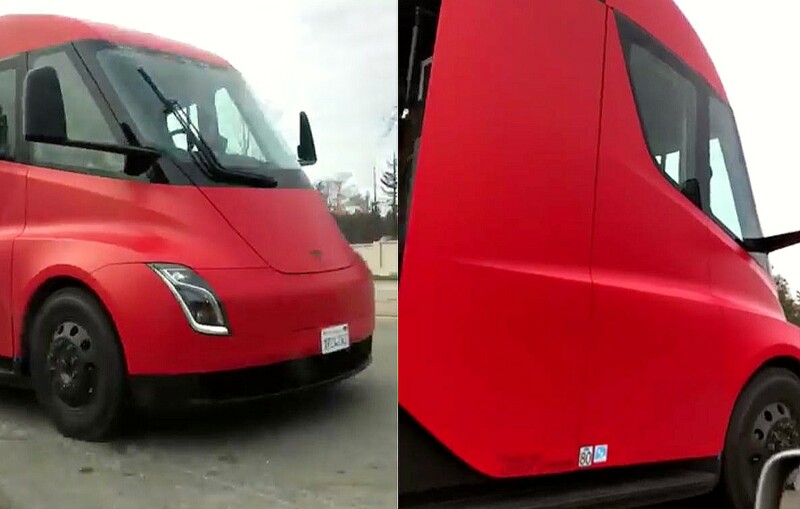 Watch the red Tesla Semi prototype’s most recent sighting in the video below, courtesy of Aiyman Hadi. Tesla Semi caught in the wild.